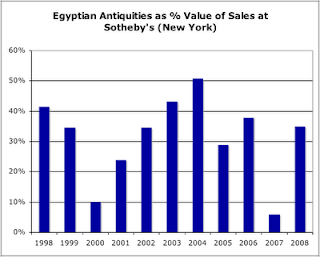 I have been plotting the sale of Egyptian antiquities at Sotheby's New York (see comments on December 2007). The June sale of antiquities raised some US$8,933,001 of which US$3,118,125 was for Egyptian items. This represents some 35% of the total value of the sale, and well above the average (15%) for the period from 1998. Egyptian antiquities fetched US$34 million for the same period (out of an overall total of US$225 million). Of these, over 65% first appear to be recorded after 1973, and just over 95% have no recorded find-spot. Fascinating data. But can you give us the n's for # of sales each year, and the median and mean prices? Otherwise it is difficult to tell whether we are seeing a shift in demand where prices are broadly higher, or whether the increase in total value is driven by the entry into the market of one or two major collectors. As you note, it only takes one Guennol lioness to skew things. Am I right in concluding that the average revenue per annum from Sotheby New York antiquities sales 1998-2008 is $22.5 million? Great to have these statistics available! It is a little hard to know what to make of the figures, though, without a better sense of: a) the n (how many pieces were sold); b) the median and mean. One question is whether changes year by year are being driven by a very small number of hugely expensive purchases, or whether there has been an increase at all pricing levels. The former might well indicate anxiety on the part of major collectors about prosecution or restitution claims, leading to bidding up the prices of well-provenanced pieces. Is there a correlation between how well-provenanced artifacts are and the prices they command? Do the 5% that have a recorded find spot generate more revenue per piece? A more detailed study will follow. The combined average annual income from the sale of antiquities at Sotheby's and Christie's (NY) is around US$ 27.6 million (taking the figures for 1999-2008). The annual average for Sotheby's (NY) for the period 1998-2008 (i.e. 11 years) is US $15.3 million. Such figures are essentially for Egyptian, Greek, Roman, Near Eastern and Arabian antiquities. Reviews of Who Owns Antiquity? Philippe de Montebello: a "Tribute"?